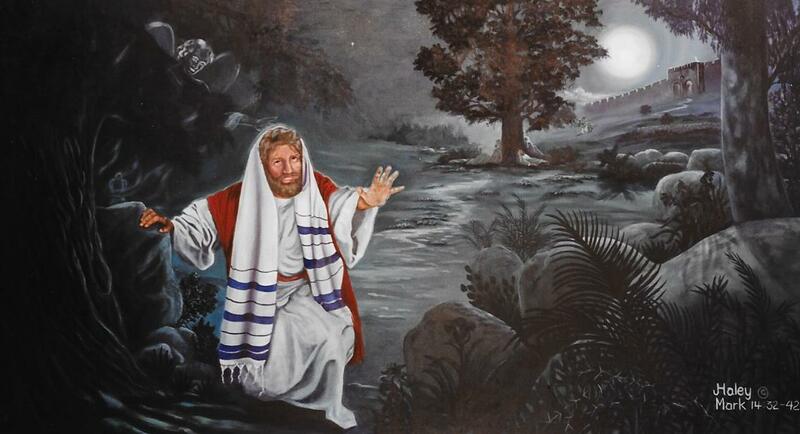 God had a man, and his name was Moses. My goal was to capture that moment when this chosen servant encountered the living God on Mt. Sinai. In my spirit I was there, on that narrow ledge, with a fierce, courageous, dedicated but very human individual. His face tells the story. I felt the earth shake and heard the depths rumble. I heard the ground crack open, rocks splitting and thudding to the ground while others were hurled into space, disappearing into the rising mist. I heard the mighty zing of Gods fire as He descended in power and might to engrave His Word on rock-the Word, NO OTHER GODS. The cutting edge of Gods finger of fire is a dove... Moses had been called, processed, tried and tested. 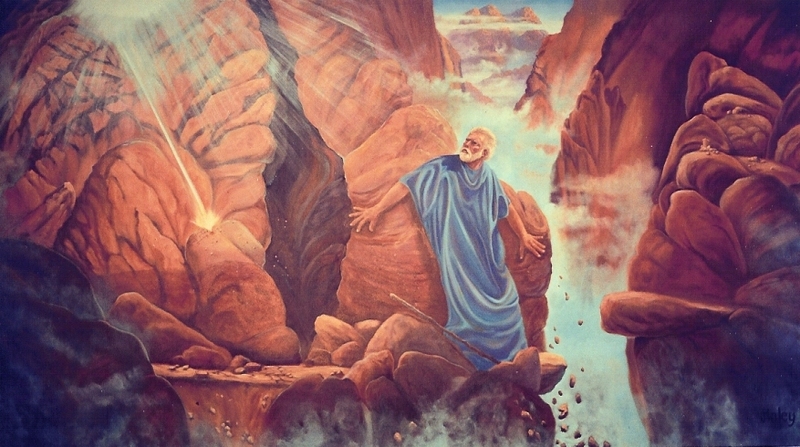 Moses had been humbled, seasoned and commissioned. He was prepared and he was not. No one is ever fully prepared for the sudden intrusion of the holy, awesome, majestic, living God. NO OTHER GODS... Are we ready? 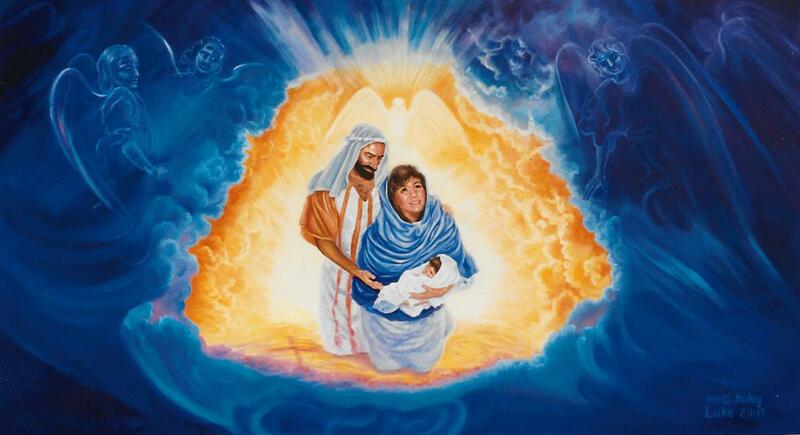 An expectant young virgin gazes longingly at the sunset and communes in her heart with the Master Artist. Sensing a presence in her room, she turns to see the heavenly messenger. The room is resplendent with a light other than the glowing reflections of the setting sun. No one else has ever heard those heaven-sent words. No one before or after, for all eternity, would ever be in such a position. No one else has ever felt what Mary felt, thought what Mary thought, sorrowed in quite the same way Mary sorrowed. No. She was blessed. Yes, she rejoiced in Christ, her Savior! 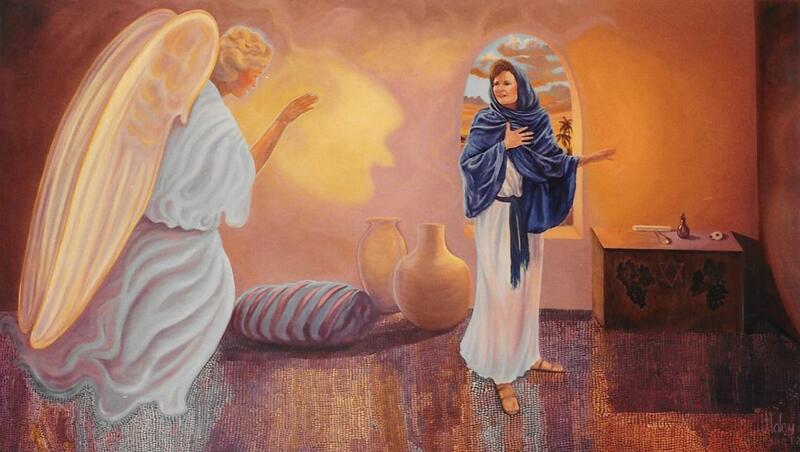 The dove glows on the wall between the angel and Mary. Several items on the chest behind Mary can be seen at close range. They are an ivory box, two cosmetic spatulas, a perfumed oil bottle, a Hebrew oil lamp, and two gold earrings. Seven items in all, which specifies Gods perfection. And Gods Perfection came in Gods perfect timing for Gods perfect purpose...His Name, Jesus Christ, Emmanuel, God with us. The Lamb of God, sinless, pure and innocent, lies peacefully in the arms of Mary. Between the swirling hues of turquoise and blue, which represent space and time, hidden along the edge of the brilliant straw are small red dashes of paint. These represent what, in time, would be mans cruel crown fashioned for the King of kings. In the straw next to the kneeling Joseph is a small cross, foreshadowing this pure childs violent death. Angels can be seen throughout the swirling border, wondering, worshipping, witnessing the Mystery of the ages, Gods priceless Gift.She kneels before her Creator, worshipping Him in joy and wonder. Tears of gratitude stream down her radiant face. God is with us. Emmanuel. I tried to capture the very heart of Mary overflowing with faith, love, joy and peace as well as personal revelations from the Holy Spirit (which, in the form of a dove, can be seen above the little family.) The kind and gentle Joseph gazes with love and appreciation at his wife and the Christ-child. The serene happiness emanating from his face bears witness of a powerful inner knowledge and understanding. God has come. The dove is seen rising in the smoke from the morning offering. 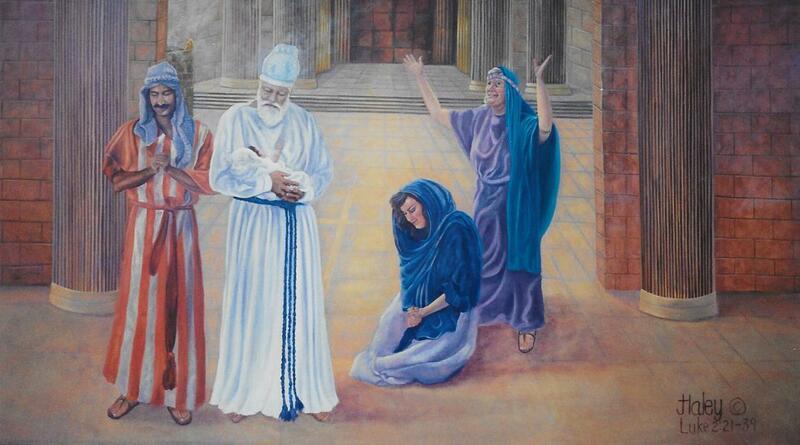 Joseph reverently prays to the God He loves. Mary, hearing powerful prophecies, ponders them in her heart as she kneels reverently before the Christ child. Anna abandons herself to the joy welling up within her spirit. She has waited all her life for this moment of exultation and she hurried out that very day and preached Christ to the astonished Jews. But it was the Lamb...the Lamb of God in that little baby that overwhelmed me as I painted this special scene. Words fail me to relate the revelation that swept over my soul that day when I painted the Lamb. He was pure. He was innocent. He was perfect. He was sweet. He was Truth. He was love. He was God in the flesh-and He came to bear all the evil, wickedness, gross perversion, ugliness and filth of sin that every person who ever lived was born into. Hands of flesh held the Savior of the world. Love radiates from Simeon, the priests face, as the awesome knowledge that he is holding His Creator penetrates his heart. Can you imagine what it felt like? I know, because the Holy Spirit revealed it to me. I will never forget it. Heaven lies within the heart of a child, sweet, innocent and pure. 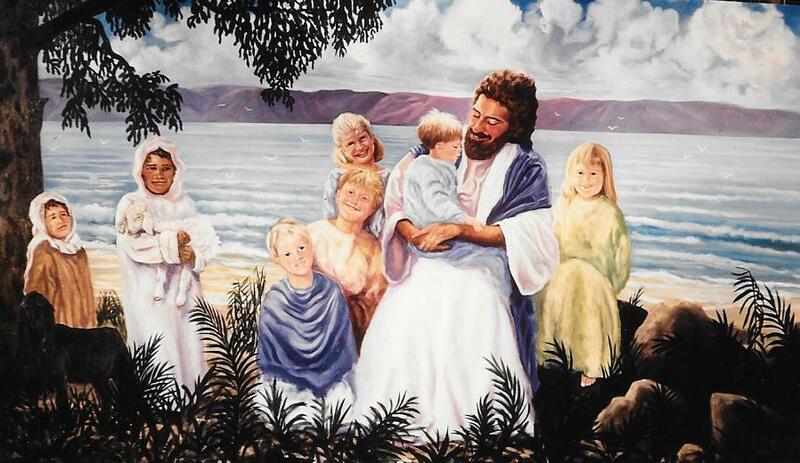 In this painting we see a sunshine Jesus relaxing on the seashore with his special friends. Children of all races and ages are welcome to come. Indeed, unless we all humble ourselves and become as little children in simple faith and love we will tragically miss eternity with Him. Hidden within the billowing clouds in this carefree and happy scene is the dove as well as numerous angels, reminding us of Gods messengers and guardians. Hearts that desire Him with childlike longing will surely find Him! 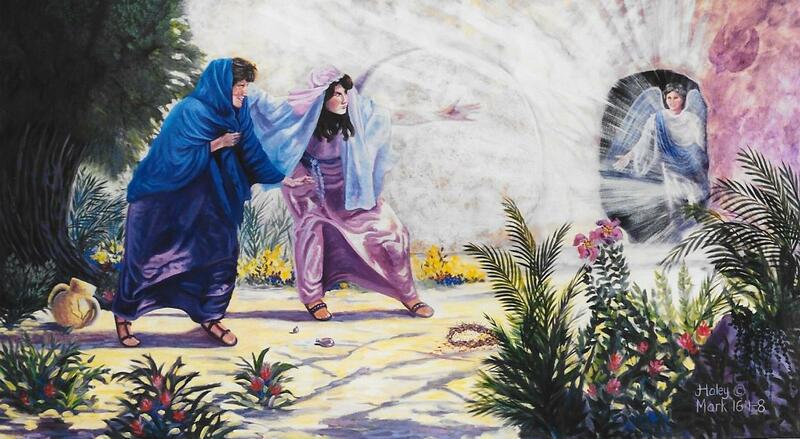 In this painting it was my aim to depict The Resurrection and the Life, full of power and glory, joy and victory, compassion and ease restoring life to this young girl. And not only life to the daughter, but renewal of faith, hope and joy to the grieving parents. 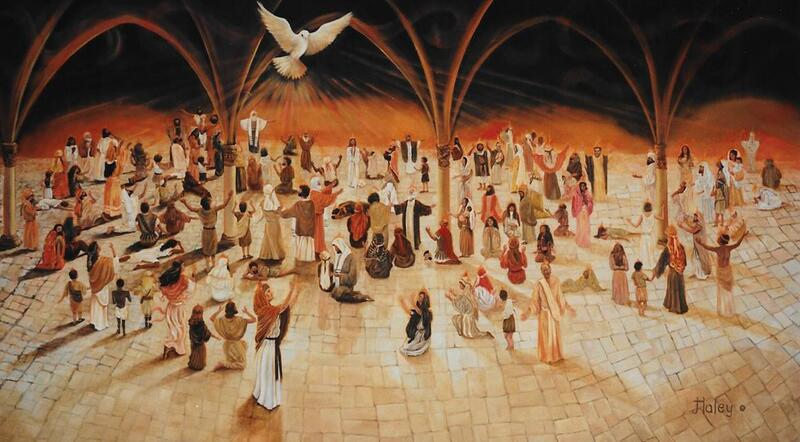 The Holy Spirit, in the form of a dove, can be seen hovering in the light above the maidens head. The anxious mothers eyes, filled with love and concern, are fixed unblinkingly upon her daughters still face. She waits prayerfully for the Master of all creation to restore life as only He can do. 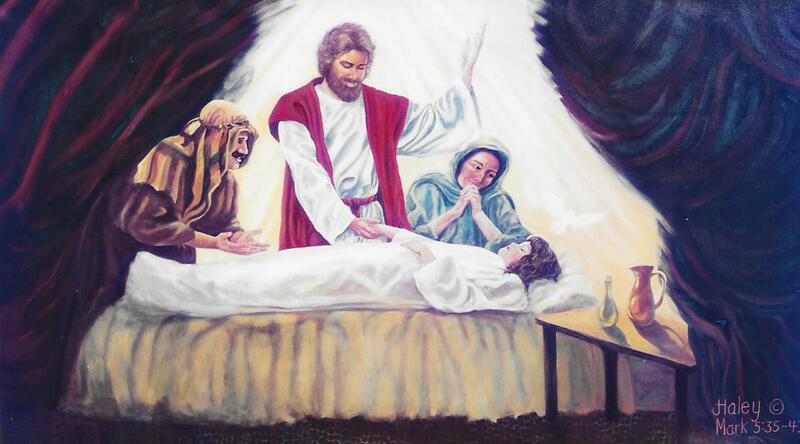 Jairus appears to be prepared by an unseen power to receive his daughter back to life again. And in the center of this historical drama, bathed in heavenly light, stands the Son of God, with joy unspeakable and power indescribable, granting a fathers heartfelt prayer. The moon casts long shadows as Jesus agonizes in prayer. Peter, James and John doze underneath a large tree. Lost to them forever is one of the greatest privileges ever offered to man...Pray with Me. So angels are sent by a loving Heavenly Father to minister to Gods Son. He knew He would be made sin for us, but He went all the way so we could be made the righteousness of God in Him. As His disciples slept on, as so many of us do today, Satan sent in his troops. They can be seen as small figures, either walking or on horseback, coming by way of the Priests Quarters with torches. The dove sits beside Him, silent, waiting. 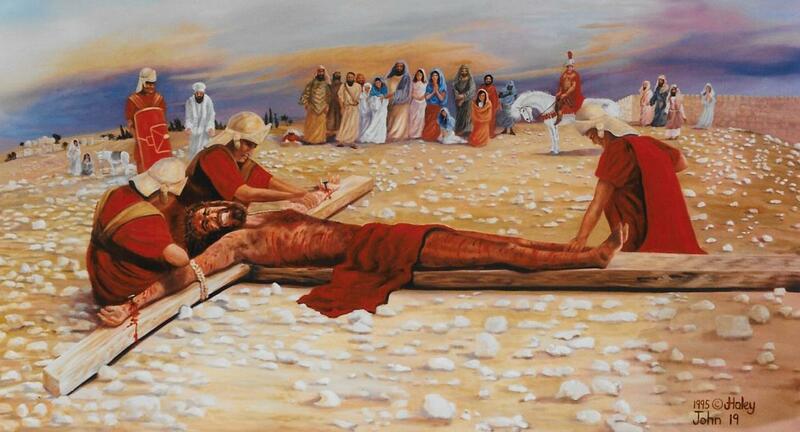 The day we crucified our Lord, our Creator, our Savior. Horrified followers and friends helplessly witness mans cruelty to man and, more than that, mans hatred for God and all that is pure, undefiled and holy. We are all guilty. Isaiah 53:6 says, All we like sheep have gone astray; we have turned every one to his own way; and the LORD hath laid on him the iniquity of us all. The priest who can be seen standing behind a Roman soldier represents the counterfeit of true Christianity; that is, self-righteousness. His face exudes pure hatred and his clenched fists betray his proud hearts desire to personally pound the Prince of Peace. Jerusalems wall reminds us of the sacrifices made outside the camp. The normally cloudless sky is beginning to darken along the horizon while wisps of wind tug and tease at the garments of stunned and sorrowful witnesses of the high cost of sin. The transparent shadow of a dove, representative of the ever-present Spirit, can be found in the lower right-hand corners of the painting. Experienced hands quickly and efficiently secure Gods only begotten Son to Satans insidious instrument of torture and death. Battered, bruised and bloody, the body of Jesus repels us yet compels us. Then, in an instant of revelation, we understand that which cannot be fully understood...the power of the cross! They came bearing more than anointing oil and spices. Their hopes as surely as the blood drained from His broken body on that cross. Now it was Sunday morning and quietly slipping into the vacant streets of Jerusalem, they groped through the murky pre-dawn darkness. Somehow, in spite of that great stone, they would, one last time, minister to Him. 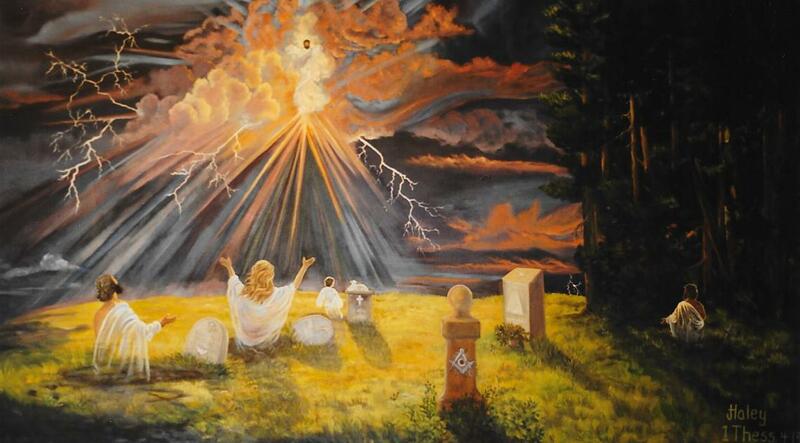 Suddenly glorious beams of light stream from the dank place of the dead. A shadow appears above the entrance. It is a dove. The costly burial fragrances and aloes so carefully guarded a moment before, drop from trembling fingers. Forgotten, they lay cracked and broken on the sandy ground, spilling their valuable contents. This reminds me of the beautiful song: Broken and spilled out for love of you Jesus. The sinister thorns lay beside shadows of the cross, covered with drops of His dried blood. Never again will they adorn the brow of the King of kings and Lord of lords. Shock and surprise transform into faith and joy as they hear the voice of Gods messenger proclaim: He is not here, for He has risen! 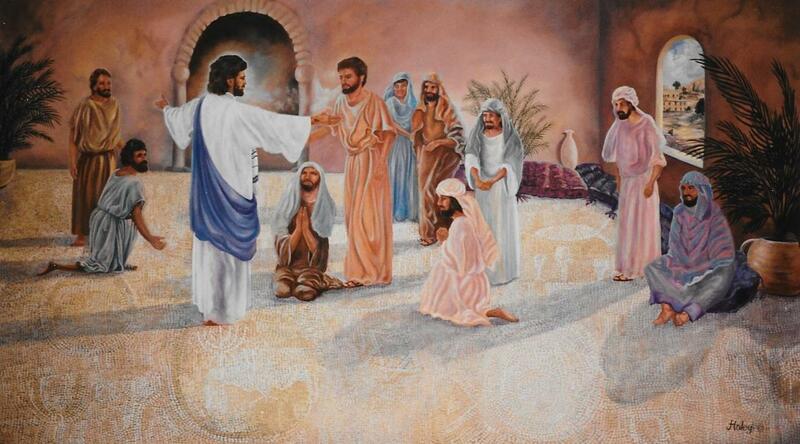 With wondering hearts Jesus faithful few followed Him up the twisting and dusty pathway. His strange determinism brought an anxious hush to the otherwise communicative and closely-knit group. Suddenly Jesus stopped. This was the place. This was the hour. The sky began to reel and twist. Swirling clouds bathed in golden light bore witness of Heavens presence and power. The image of an eagle, conqueror over the serpent, appears above them. In front of this great bird is the brilliant form of a dove. Three of the four living creatures are represented in the clouds to the right of this painting-a lamb, a lion and an ox-each with its own representation of Christ and the Church. And then the Man, Gods own Son, glorified and victorious gives His final blessing and commandment, You shall be My witnesses...	Are we? The dove is quite visible in this painting-the promise descending in power. 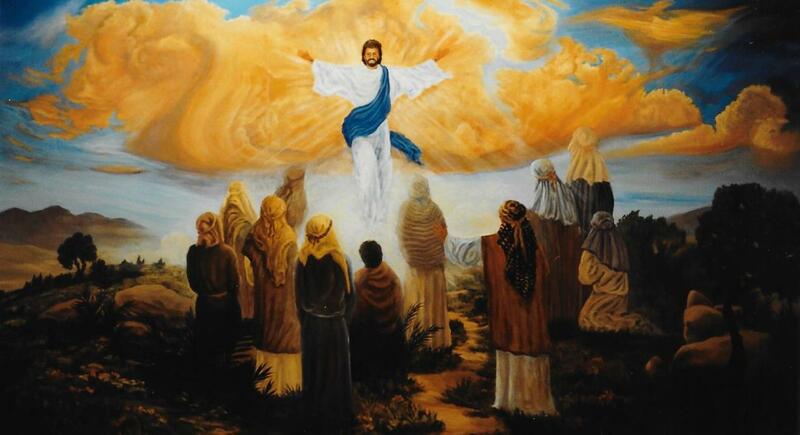 I could hear in my spirit the holy commotion as the fire from above united with waiting hearts. Each individual is painted in great detail, yet there is a oneness, a unity. There is no respect of persons with God, and here we see the Holy Ghost poured out on men, women, teens, children, the educated and non-educated, the rich and the poor. Different races are represented. My heart was stirred at the mighty wind of the heavenly dove as He descended on needy hearts. And very nearly was I moved with envy to have been a part of this early church which, because of their love for Jesus and one another, witnessed the mighty Presence of God in their midst. Suddenly the sky erupts in a blaze of color while jagged fingers of lightning rend the heavens. The earth trembles violently at the explosive presence of the power of God Almighty. Forgotten graves of the redeemed instantly lose their death grip as gapping crevices zigzag across the musty sod, releasing their occupants. 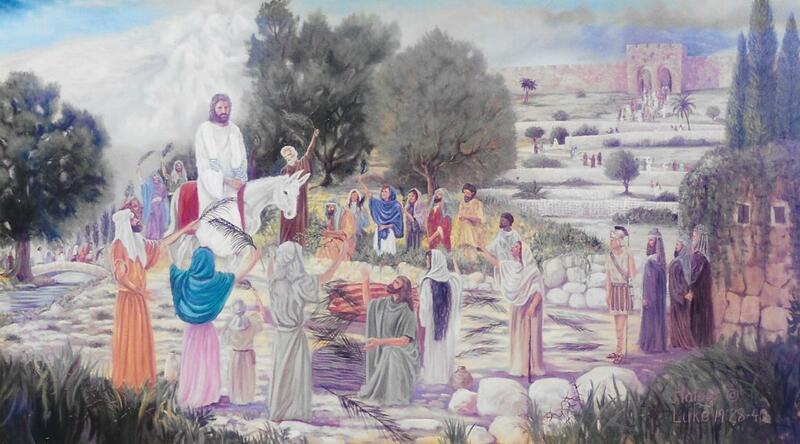 This painting reveals the Hope of the ages-the resurrection of the righteous dead. Oh joyful reunion! We see a father, mother and child. To the right is a lone believer, one who in life suffered rejection and was an outcast and despised. But he had a Friend who would never leave him nor forsake him. Sadly, millions will remain prisoners of death. Their graves will remain closed when Jesus returns for His own. Tombstones engraved with vain philosophies of men and doctrines of demons stand as mute evidence to the infallibility of Gods eternal Word, He who has the Son has life; and he who has not the Son of God has not life. Click on links below to view other art galleries and also to see prints for sale through Gentle Shepherd Ministries.